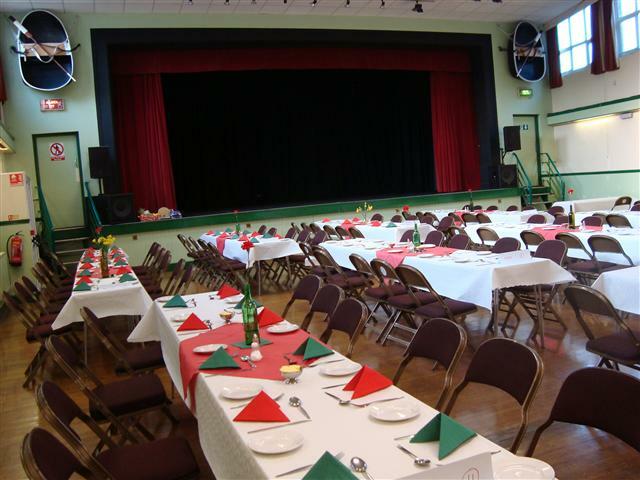 The Town Council owns and operates St Peter's Civic Hall, one of the town's premier venues for concerts, eisteddfodau, plays, coffee mornings, luncheons, conferences, seminars, meetings, training courses, forums, craft, record and antiques fairs, exhibitions, demonstrations, festivals, floral shows, competitions, presentations, parties, dances, discos and weddings, in addition to civic ceremonies and presentations, and blood donor sessions. Booking: for hire details, costs and availability telephone 01267 235199. - John Street Car Park, John Street. Although there are larger theatre/arts venues in Carmarthen, none is as accessible to community groups as St Peter's Civic Hall. This is the largest flexible space available in the town centre, which can accommodate any arrangement of tables and chairs. Many small arts-based groups, e.g. amateur dramatics groups, are attracted to a venue that is affordable and versatile. St Peter's Civic Hall has also been the venue of choice for larger companies such as Theatr Genedlaethol Cymru, the Owen Money Theatre Company, Mike Doyle and Arad Goch. The hall is newly refurbished and decorated. History of St Peter's Civic Hall: Number 1, Nott Square, was acquired by St Peter's Parish, converted into a hall and opened as a Church House in 1916, at a cost of over £2,500. In 1964 the rear wall and foundations of the Church House were found to be unsafe, and the building was demolished and rebuilt in a contemporary style. In the 1970s the Church in Wales sold St Peter's Church House to the Town Council, and St Peter's Civic Hall continues to be run as a town centre amenity.